The Purpose of this document is to Outline Very Simple and Easy Modifications that can be made to the EA through to the EL Series of Falcon Models. 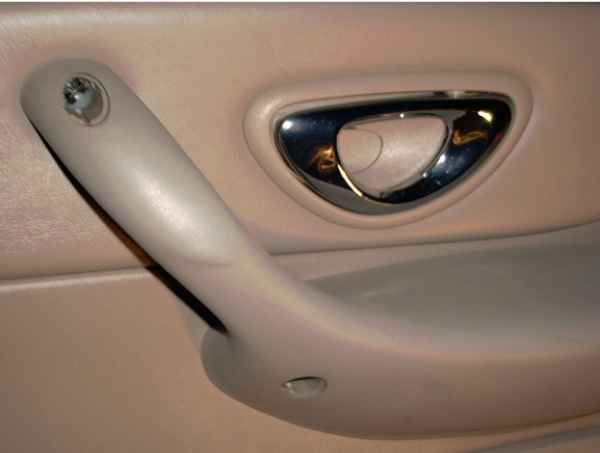 This Section of the Document describes how to fit Chrome Interior Door Handles to an EF or EL Series Falcon. These are the same Chrome door handles that are fitted to some Fairmont Ghia, Fairlane and LTD models, as shown in the above picture. Please Note : Apparently, there are 4 Different types of Chrome Door Handles that are available from Ford. The Second Types are Chrome Plated Plastic types, (Again with 2 Different Colours, Cuppacino, and Luna Mist). As far as I am aware, All EFII-NF-DF Models fitted with Chrome Door Handles, had the Full Chrome Door Handles. The Plastic Plated Chrome Handles were introduced on SOME of the EL/NL/DL Series. Unfortunately, I do not know which EL/NL/DL Models had these fitted. Also, the cost of these Door Handles from Ford are prohibitively EXPENSIVE - Around $50 Each ! Having overcome the initial Sticker shock of these items, they are very worthwhile, in terms of adding a prestige and exclusivity element to the interior of your car. Now for the Difficult part, Firstly you will need to pop the Little plastic cover in the middle of your existing Door Handles. To do this, it is easiest to use a Flatheaded Screwdriver, and pop it from the top. Once this has been completed, you will notice a large phillips head Screw Sitting there, holding the Door Handle in place. Use a Phillips head screwdriver, and unscrew the screw. Finally, slowly rmove the handle from the door trim, you will then notice that the door handle is attached via the Door Handle Rod. The Door Handle Rod can be disengaged by twisting and turning the door handle, and pulling the Rod from out of the Door Handle plastic Washer. Note : There are no clips, or no tricks to this, its simply a matter of playing around to feed the rod out from the door handle. Firstly feed the Door Handle Rod back in to the Door Handle washer. Again, you will need to twist the Door Handle around the Rod, in order to feed the rod back in to place. Now that has been completed, you will need to screw the Door Handle back in to the door trim. Finally, before clipping the plastic Screw Cover in to place, check to see if the Door Handle is operating correctly. If it isnt, then the Door Handle Rod is not sitting correctly on the Door Handle Washer, so remove the Handle again, and play around with it further. If all is well, then simply pop the Screw cover in place, and enjoy ! In terms of Very Cheap, and Easy Modifications, this one takes the Cake ! And the Total time to execute this modification should not be any longer than 1 Hour. Anyway, the Footwell Courtesy Lamps are the Lights that are placed underneath the Falcons Dash, and basically light up the area around the Driver's, and Front Passenger's Feet. Now Before you discount this mod as being stupid, such lighting makes a huge impression on passengers at night time, as it helps them enter and Exit the Vehicle by Illuminating the Area that they are to place their Feet ! Some Electrical tape, solder, and soldering Iron. Please Note : If you are one of the Lucky Buggers whom has a Manual Transmision, and dont know WTF I am talking about, then check the Bulb Holder and Bulb used for the Rear Mount Stop Light, as this also, is EXACTLY the same as the Auto Transmission Bulb and Holder. Once you have these parts, its then time to start running the Cable to the Nearest Courtesy Lamp. WARNING : If you have a GLi model, then you will notice that there is no Ignition Keylight Illumination. This will mean that the Wire for the Footwell lamp will need to be run from the Centre Console Connector, located underneath the Radio, behind the Cigarette Lighter. This connector has 8 Pins, with only a couple pins used for wiring purposes. These are located on the second column of the connector, just above and below one another. If you dont have a GLi model, then Possibly the Easiest place to connect your new footwell lamps, is to the Ignition Key Illumination. The Ignition Key Illumintation Bulb is wired Directly to the Roof Mounted Interior Lamp, and as such, is perfect for this application. What you now nned to do now is solder some figure 8 Wire to the Bulb Holder, then Fit the Bulb Holder in to place ! Luckily for you, Ford has Kindly already provided the Mounting points for these Bulb Holders, so all you need to do is locate them, and screw your Bulb Holders in to place. See Above pictures for more details of the Locations for the Bulb Holders. 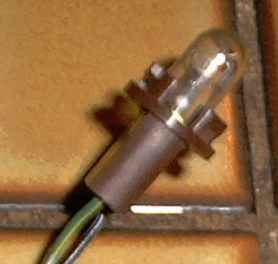 The Drivers Side Footwell Lamp is located just under the Bonnet Release Lever, and has a hole around 1cm in Diameter. 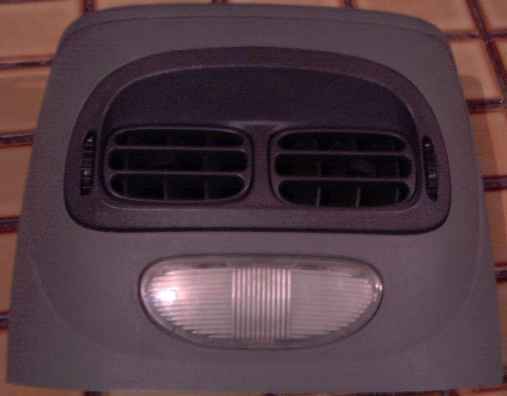 The Passenger Side Footwell lamp is located Underneath the Glovebox, around the Centre. Again there should be a round Cut out existing for the Bulb Holder. Finally, with the Bulb Holders Mounted in their correct positions, you will need to run the cabling throught the Dash, to the Ignition Key Illumination Lamp. This Unfortunately is the hard part, and will require some creativity on your part ! Once the above has been completed, simply splice the figure 8 wiring in parallel with the Ignition Key Lamp, and you are in business. This modification is suitable for all EF and EL Model Falcons, and is the same as the Centre Console Courtesy Lamp fitted to Futura, Fairmont, Fairlane, and LTD models. The Centre Console Lamp is used to Further Illuminate the Back Footwells of the Vehicle, as well as add further prestige and visual appeal to the interior of the vehicle. See above Footwell Lamp Illumination for more Information regarding the Bulb and Bulb Holder. You will also need around 2 metres of Figure 8 Wiring (Thin and Cheap). Firstly, you will need to remove the existing Plastic Cover, for the Illumination. This can be acheived by using a flat headed screwdriver, and by prying the Bottom of the Plastic cover, from the Middle, outward, to disengage the plastic clip. In the above photo, you can see where the Bulb Holder is to be screwed in place. The Next Part that you will need to complete, is to run a length of the Figure 8 Cable, from the centre console, to the Ingition Key Illumination. 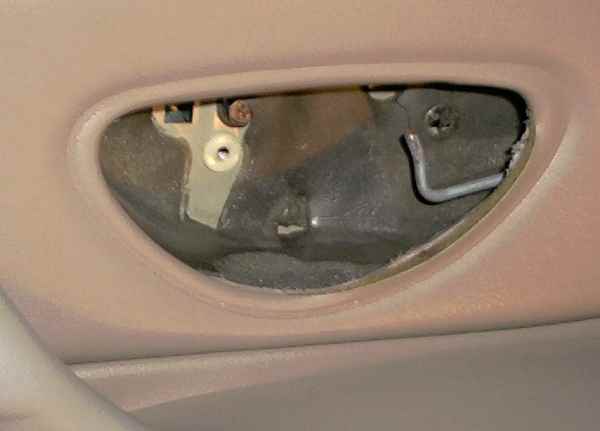 This will mean that the Wire for the Centre Console lamp will need to be run from the Centre Console Connector, located underneath the Radio, behind the Cigarette Lighter. Simply Connect the wire up in Parallel with the existing Keylight Wiring, By Soldering a connection directly on the wiring. Finally, once this has been completed, simply connect the newly Run wiring, up to the new Centre Console Lamp, and Plug the Bulb Holder in to place. To do this final part, simple make sure that the cable runs from beneath the centre Console, and Feed the Bulb Holder From underneath the Centre Console, and in to the Bulb Holder. Alternatively, you can Unbolt the Centre Console by unscrewing the 2 Screws, near the Front Seatbelt Clamps, and lifting the centre console partially upwards.